It’s that time of year again! Halloween is the perfect time to let your creativity shine. If your office allows, go above and beyond this year and have a little fun decorating your office cubicle or workstation. If you’re not creative, don’t worry! Below is a list of six different ways that will make your cubicle stand out this Halloween season. Still missing summer? Then bring the beach to your cubicle! This is a more relaxing type of Halloween decoration, but it’s still fun and will liven up the office. To make this scene perfect, decorate your cubicle with seashells, leis, an inflatable palm tree and parrot, beach chair (if there’s enough space), beach towels, and other little summer decor that you can put on your desk. If you want to really feel like you’re at the beach, change the screensaver on your computer, bring in a radio, and play some beach music! 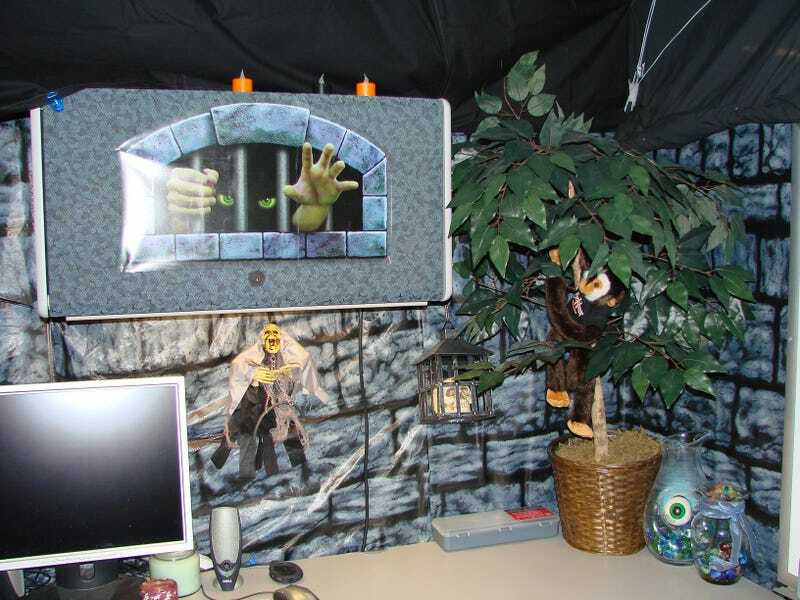 Beware of the ghosts, witches, and vampires if you enter this haunted cubicle.To give the perfect scare, grab some wrapping paper that reflects the look of a dungeon and wrap your whole cubicle with it. 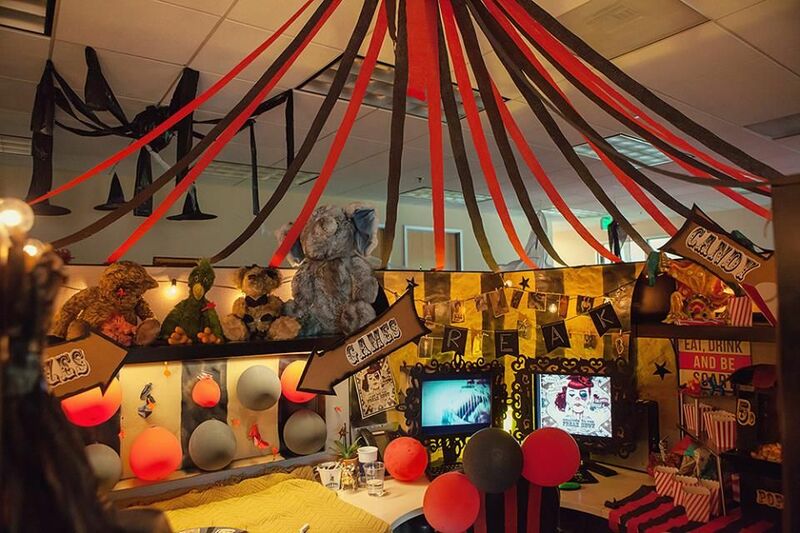 On the outside of your workstation, have a sign that says “Enter if you dare” with bats, spiders, and spider web. On the inside, add spider web lining to your desk, a few skeleton heads (you could even hang them from the ceiling if it’s low enough), vampire teeth, witch decor, a jar with floating eyeballs, and a huge spider to top it off! 3) Let’s Go To The Carnival! You can either make this a creepy carnival or a fun carnival. For a carnival cubicle you will of course need the essentials that’s at every carnival.To start, create a miniature “snack stand” that has delicious popcorn and tasty treats such as skittles, gummy bears, starbursts, and whatever else your sweet tooth desires! Aside from food, people love playing games when they go to a carnival. I mean, who doesn’t enjoy winning prizes? If your cubicle is big enough, you could add a fun game of Balloon and Dart and have a little area with small prizes to give away. This is an excellent way to get employees socializing, and it gives you something fun to do if you need to step away from the computer. If you want to make it a little creepy, attach some red and black paper to the back of your cubicle and add some yellow lights. 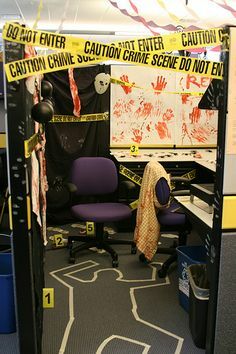 For a scarier look, make your cubicle into a crime scene. If you have a glass frame on your cubicle wall, you could smear fake blood on it, but if not, just outline your hand on red construction paper and attach it to the outside of your cubicle. The hand prints had to come from someone, right? With white chalk or tape, outline a figure of a body on the ground to make it look like the victim. On the inside of your cubicle, add evidence and number each piece of evidence with a post it. Some evidence to include would be a white sheet with splats of fake blood, a plastic knife, finger prints, hair, and anything else you would want at your crime scene. Don’t forget the caution tape! Want to be the captain of your own ship for the day? 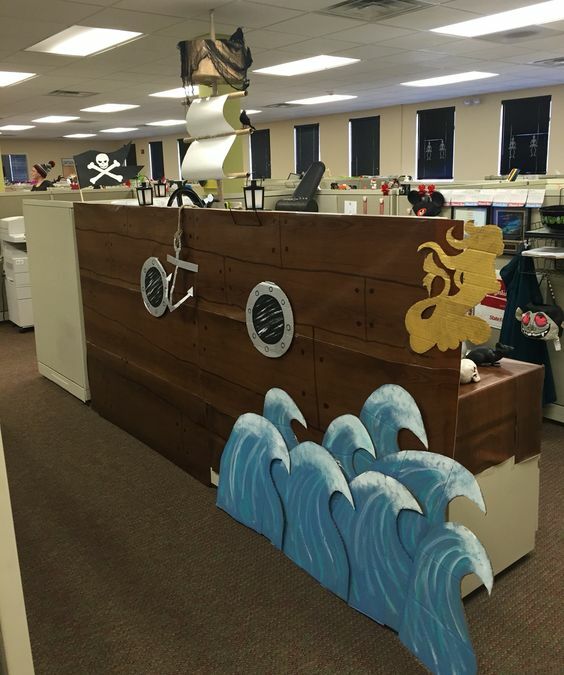 To turn your cubicle into a pirate ship, you are going to need some water to float your boat! On the outside of your cubicle, decorate it at the bottom with waves, or if your whole aisle likes the idea, take a huge piece of paper and draw a plank in the middle and waves on the side to give it a “Walk the Plank” look. You could also add some some seashells, decorative fish net and fish! Of course a pirate needs the necessities for a day’s travel. To decorate the inside of your cubicle, you will need a telescope, assorted pirate jewels, a pirate hat and eye mask, porthole mirror, a wood ship wheel, an anchor, and a toy buccaneer sword! You cant forget about the treasure map which leads to the treasure chest! 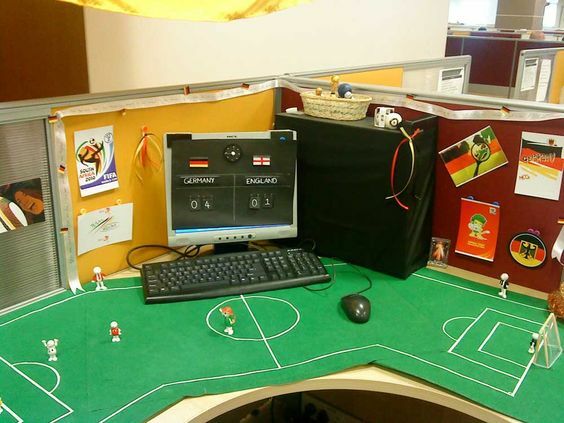 If you’re a football fan or any other type of sports fan, you will love this cubicle design! All you need for this is a toy football set, some fabric or construction paper, and a marker to make a field that will fit on your desk. Wondering where to keep score? Attach a piece of construction paper in front of your monitor and keep the score that way. To show some team spirit, attach the team colors, logo, and flag on your cubicle walls. We hope you have a Scare-tastic Halloween! Comment below and let us know other unique ideas you have!